Your India trip begins from your arrival into Delhi, the political capital of the country. Next visit Agra, the Mughal city famous for Taj Mahal and other monumental marvels. Continue to Jaipur, a royal city with diverse colors and history brimming monuments and citadels. Drive further to Pushkar, the holy city. Continue to Udaipur, most romantic city of Rajasthan. Discover the forts and palaces of the marwar region as you travel further to Jodhpur and Jaisalmer. Next visit the royal city of Bikaner and continue to Mandawa, famous its hand painted havelis and frescoes. Continue drive to Delhi and connect flight to Chennai and onward to the world heritage town of Mamallapuram. Then on the Journey continues to south india famous temple and best historical sights. After game in the national park of periyar, the best backwater destination-Kumarakom and the tour ends with drive to old city of Cochin. 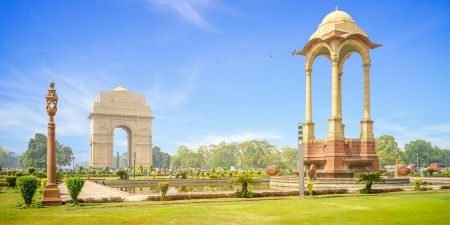 Welcome to Delhi, India!On arrival at Delhi International Airport you will be met and assisted by our company executive and transferred to your hotel. Tour Old and New Delhi visiting Raj Ghat, Mahatma Gandhi’s serene and evocative cremation site, India Gate (the War Memorial) and the Presidents House (from the outside), the Baha’i Lotus Temple (closed on Mondays) - this distinctive lotus shaped marvel in marble is a symbol of peace, the Qutub Minar a stunning 240-foot minaret, the tallest in the world surrounded by an elaborate complex built in the Indo-Islamic architectural tradition. Drive to Agra. On arrival check-in. This morning visit Taj Mahal a sunrise (closed on Fridays). Return back to the hotel. Later take a marble craftsmanship demonstration. Start with the visit of Itmad-Ud-Daulah monument. Later, discover the Agra Fort. Remarks: Please check with the tour guide and re-confirm your pick-up time. Please be ready at-least 10 minutes prior to the pick-up time. Drive to Jaipur. En-route visit Fatehpur Sikri an abandoned capital from the Mughal Empire between 1570 and 1586. After a traditional welcome by your host, learn about their culture, cuisine, rituals and festivals. Listen to the stories of the Pink City from your charming hosts, admire the traditional décor of Hindu gods and Savor the great flavors of Rajasthani cuisine. Sit down with the family to feast on naans, lentils, curry, and dal- bati etc, as well as many other dishes typical of Rajasthan, including a dessert or sweet dish. Visit Amber Fort. Have a royal ride on elephant (subject to availability) up the hill like the Maharajas of past times and visit the Jagmandir (the hall of victory). Stop at the Hawa Mahal (Palace of Winds), then proceed to The city palace. Continue to the impressive Jantar Mantar. While you are in the city, visit the nearby popular street markets of Jaipur. Drive to Pushkar a sacred city for Hindus. Afternoon, arrive in Pushkar; check in to the hotel. Have a walking tour of the holy city of the God, Brahma; visit the holy Pushkar Lake and the famous 8th century Brahma Temple dedicated to Lord Brahma. Experience a special Pooja ceremony at a Ghat with a Hindu priest on the banks of Pushkar Lake. Overnight in Pushkar (Special Deluxe Tents during the Pushkar Camel Fair). After breakfast drive to Udaipur. Upon arrival in Udaipur, check into your hotel. Sail past picturesque Ghats and palaces and stop at the island of Jag Mandir, a 17th century water palace that witnessed two important historical events. Start yout tour with visiting the City Palace, overlooking the blue waters of Lake Pichola. Afterwards, walk towards the Jagdish Temple to study its many remarkable friezes. Later, explore the Old City, wandering through its bustling streets lined with art shops, spice vendors, tailors and more. Drive to Jodhpur. En-route visit Ranakpur Temple built in the 15th century and located in a valley on the western side of the Aravali Range. This morning visit Mehrangarh Fort and Jaswant Thada. Later drive to Jaisalmer. Tour Jaisalmer and visit the fort, often referred to as the Golden Fort. Walk through the narrow streets of the fort to see the Nathmalji-ki-Haveli, Patwon-ki-Haveli, Salim Singh ki Haveli. Outside the walls of the fortified town is the small oasis of Gadi Sagar, which led Prince Jaisal to found his city. See the sunset at Sam Dunes known for its enormous stretch of sweeping dunes with little or no vegetation that make it a surrealistic landscape with ever changing patterns carved by winds on the sand. Enjoy a camel ride out on the dunes at sunset before returning to “base camp” for beer/soft drinks and snacks while being entertained by folk singers and dance performances. Morning breakfast. Check-out and drive to Bikaner. Arrive in Bikaner; check in to the hotel. Spend time day at leisure. Today proceed for sightseeing tour of Bikaner. Visit Junagarh Fort. Then, drive to Mandawa. In the afternoon arrive at Mandawa. Check in to the hotel. Enjoy a walking tour of Mandawa dominated by a painted arched gateway. Explore Chokhani and Ladia Havelis and the street with Saraf Havelis. After breakfast, check-out and depart for Delhi. On arrival transfer, directly to airport to board flight for Chennai. Welcome to Chennai! On arrival at Chennai International Airport you will be met and assisted by our company executive and transferred to Mamallapuram. Spend day at leisure. You may relax by the beach. Visit Arjuna's Penance. The details, dating from the 7th century, portrays the flow of the Ganges down from the Himalayan mountains as well as scenes from Indian daily life. All the Five Rathas shrines are carved whole from an outcrop of rock. The five temples are dedicated to heroes from the great epic of the Mahabharata. Enjoy the detail of the carvings which include gods, humans and elephants and wonder why the temples are incomplete and were never consecrated. Depart for Pondicherry, set on the Bay of Bengal with delightful unspoiled beaches. En-route visit Auroville, the French village. Check-in to hotel. Rest of the day is at leisure. Drive to Tanjore. En-route you may stop at Dharasuram Temple. Check-In to the hotel. Rest of the day leisure. Explore Tanjore and visit Brihadeshvara Temple. Afternoon, proceed to Madurai, a vast, pulsating city, one of the oldest cities in South India. Wander through the fun, packed streets, full of pilgrims, wandering cows, open-air kitchens and colourful bazaars. Arrive in the evening; check into your hotel. Day at leisure or pre-book one of our optional tour. The Bi-Cycle Rickshaw tour of Madurai offers you a memorable experience. Walk through the interesting narrow streets and lanes of Madurai showing the typical life of locals. By taking this tour you are supporting the rickshaw pullers and at the same time encouraging locals to use rickshaws. By Cycle Rickshaw we visit the Flower, Fruit and Spice Market. Stop to admire the Thirumalai Nayak Palace, visit the Gandhi Museum, and small scale industries like vessel and cloth making. After breakfast, drive to Peiryar, also known as Thekkady. Afternoon Check-in to the hotel. Later, enjoy a guided Spice Plantation tour in the area. 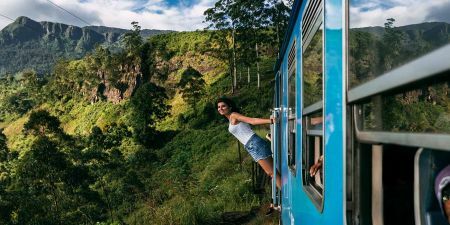 You may also enjoy an optional short ride on an elephant (supplement cost applicable) to get the best view of the stunning scenery. Morning at leisure or pre-book one of our optional tour. In the afternoon, depart for Kumarakom a cluster of tiny islands almost impossibly beautiful. Rise early for the best chance to spot elephant, deer, wild boar, mongoose and colourful birds on a dawn walk. Your experienced guide will know the best places for game viewing and, if you are extremely lucky, you may even come across elusive leopard and tiger. Afternoon meander through the old districts of Mattancherry, Fort Cochin, St Francis Church and Santa Cruz Basilica, Dutch Palace. Also, admire the Chinese nets which line the shore of Fort Cochin. Enjoy this "story play" genre of art where elaborately colorful make-up and face masks wearing actor-dancers, traditionally are all males. The epic Ramayana comes to life at a Kathakali performance, traditional Keralan dance, where the characters use larger than life gestures, wear outrageous costumes and dramatic make up. After the dance is over, proceed to the restaurant at Hotel Fort house which is situated, opposite to the dance theatre. This waterfront restaurant offers a pleasant ambience, generated by the fresh sea breeze and the gentle sounds of water lapping against the pier. Seafood dishes, a hallmark of the Kerala Latin Christian cuisine, are among their specialties. Remark: The Kathakali dance show and dinner is USD 50 per person, min 02 pax. Today, transfer to Cochin International Airport for your return flight home.